Once-cheap economy cars tend follow the same pattern as they enter the realm of collector cars. The early models are generally worth a small fortune because they were built in relatively low numbers and few remain in good shape. The newest examples quickly pick up value as they represent the model’s ultimate evolution and are generally the most comfortable and convenient to drive on a regular basis. Cars built in the middle of the production run are less fortunate and often seen as a last resort by collectors. Look around and you’ll see this theory applies to applies to many so-called people’s cars including the Citroën 2CV, the Austin Mini, the Volkswagen Beetle and even the Renault 4. 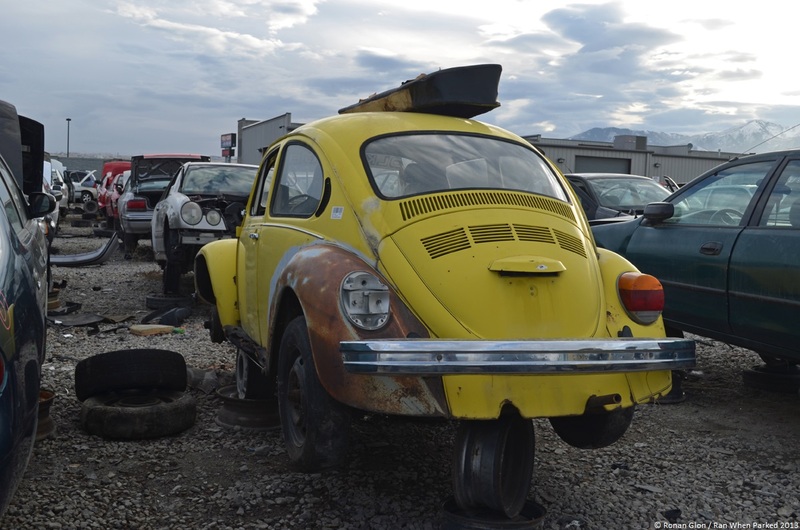 Photographed in a Utah wrecking yard, the 1974 Beetle pictured below is clearly not in good shape but it is unquestionably salvageable. It appears to have lived the typical life of a Beetle in a rural U.S. town. It was driven regularly and passed on from owner to owner until time had taken too big of a toll on it. At this point it was either parked or given to someone who hoped to restore it but the end result is the same: It’s ending its life surrounded by junked late-model cars. The Beetle was brought in to the junkyard complete and the few parts that are missing were removed at the yard. We’re guessing the bulk of it was stripped before it was crushed as Beetles regardless of age aren’t a common find in junkyards anymore. As a side note, it’s interesting to point out that it’s almost unthinkable to find a Beetle in this shape in a European junkyard today. Beetle values have reached grotesque heights throughout most of the Old Continent and even a rough mid-1970s example like the one below would be listed in the classifieds for several thousand euros, most likely with the words “rat rod” in the description. Oh look, it’s Jack Torrance’s car! Ha, good call! Brilliant movie. Reblogged this on A History of Bestselling Audis. i see way to many good parts. i hope someone saves this beetle. Ran When Parked was founded in 2007 and focuses on unique and unappreciated vehicles from around the world. It is published by Ronan Glon and Ian Rothwell. We write about our own cars, cars we work on, cars we find, and other automotive things we find interesting. Enter your email address to follow RWP and receive notifications of new posts by email.